Feeling like having a good ol’ chant at your next game? 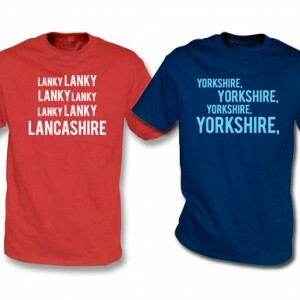 New in store is the “Lanky Lanky Lanky Lanky Lanky Lanky Lancashire” chant design, available in a t-shirt, slim fit, hoodie and sweatshirt, along with kids sizes – all in red! You can get your hands on it here – or perhaps you’re on the other side of the fence and will chant “Yorkshire, Yorkshire, Yorkshire, Yorkshire” instead? This blue design is also available in a t-shirt, slim fit, hoodie, sweatshirt and kids sizes! If you’re on the blue team, find your new design here! So get chanting with your new t-shirts, be it red or blue!